Each year, disruptive weather causes trucking congestion costing $124B, accounting for 28% of highway crashes and 19% of all fatalities, and wasting upwards of 32.6B hours in weather-related delays in the U.S. alone. To optimize workforce productivity and route selection, organizations with mobile workforces -- such as freight and logistics companies and retailers -- need a comprehensive, single view of the many factors that affect the planning and safety of their distribution, dispatch, and driving. The Weather Company® Operations Dashboard for Ground Transportation offers this and more. Monitors live global radar and satellites, plus current, forecast and road weather. Includes live roadway feeds, user-reported conditions, mapping, distance and annotation features. 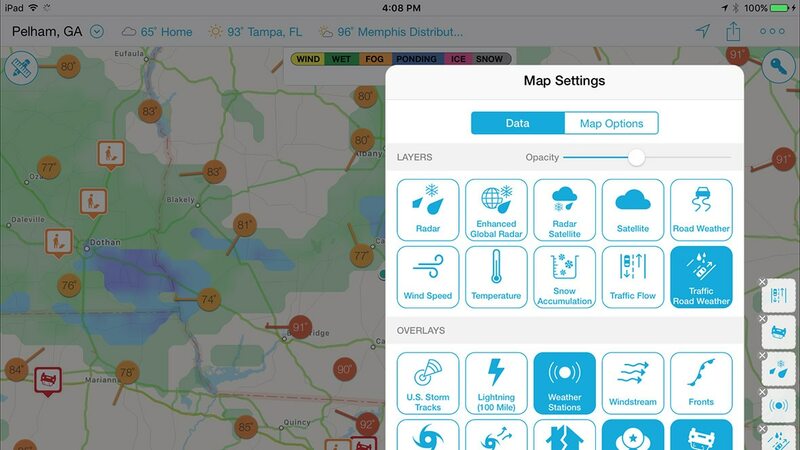 Sends real-time mobile alerts that warn drivers of approaching weather disruptions.